I stopped procrastinating and finally made my blog! 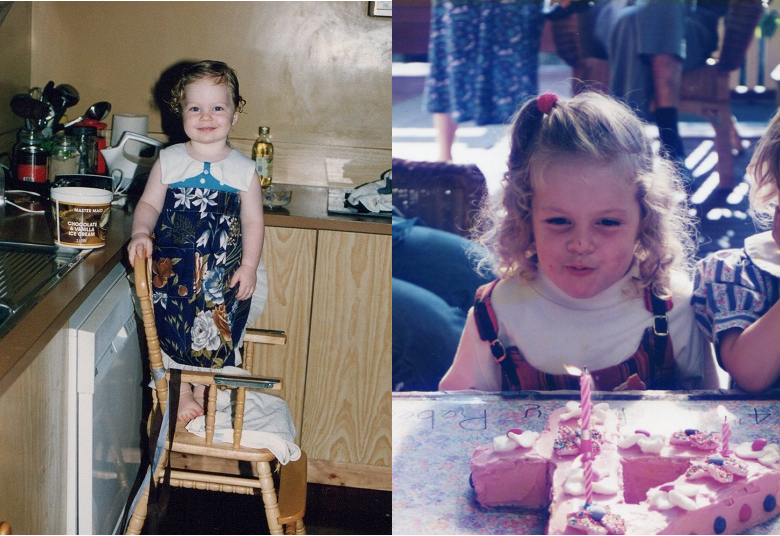 Cooking in a home made apron and blowing out the candles at my fourth birthday party. I grew up with a love of cooking inspired and fostered by my Mum, Vicki, who was always making delicious dishes, whether they were thrown together ‘surprise chef’ style, or took all day. We are lucky to have a Mum, who (among other virtues too numerous to mention here) is so good in the kitchen. It meant that we always had awesome birthday cakes and party food, and that we got to spend hours making biscuits, cupcakes and (very occasionally, I must admit) dinners with her. 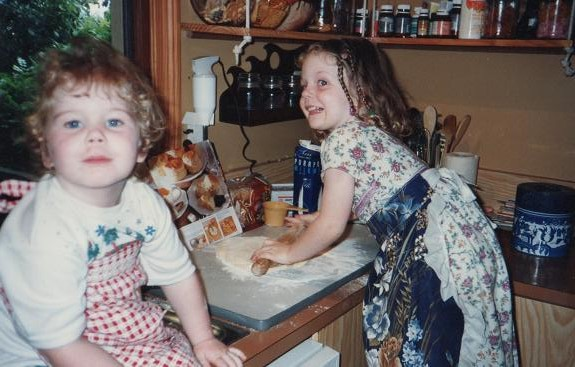 Me and my sister Zoe in our kitchen in Auburn. My home cooking odyssey has been punctuated by many tantrums. Lots of my solo cooking ventures have ended in success only after I angrily refused and then tearfully begged for Mum’s assistance. Now that we live apart, she gets texts and calls for advice on a regular basis. Through high school my interest in cooking increased and I decided to take food technology and hospitality, as well as experimenting with different recipes at home. The flexible timetable and self direction of my five years at uni meant that I could cook more often. It and reading were excellent forms of procrastination. Baking became my main interest in the kitchen. I love to consume baked goods, so I suppose it’s only natural that I wanted to be able to produce them whenever I had a craving or get together. I love floral flavours and colourful presentation, but some of my least attractive creations are my favourite to eat.I enjoy being creative beyond the kitchen, and this year I’ve had a renewed interest in sewing and making beaded sun-catchers. I have spent more time baking this year than any other time in my life, having graduated uni and working to save up for a big overseas adventure with my best friend, Jackie. 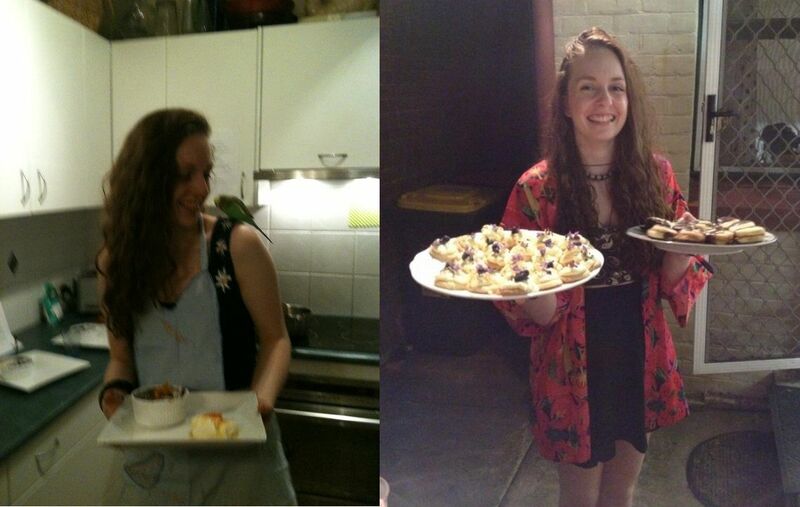 With my budgie Ronald after a Masterchef TV cook along c.2010, and at our housewarming last year. On our return I decided to start this blog to record my baking so that I can write more than a photo caption about the things I bake. I am proud and pedantic and don’t like to admit to mistakes, but I also like to experiment in the kitchen. I’m happy to say that these days my experiments are usually successful, and I try to treat failures as lessons on what not to do next time. I look forward to adding pictures and recipes whenever I can and hope that visitors will enjoy becma bakes! Good luck with your blog! I’m always looking for new recipes!